Jamieson, who finished with three goals and three assists, scored during the Knighthawks' 4-0 run which made it 12-10 with 12:54 to play. "Jammer" later sparked a two-goal surge in the final minutes. His dunk from behind the net made it 15-12, and he then picked up an assist on Resetarits' goal with under three to play. 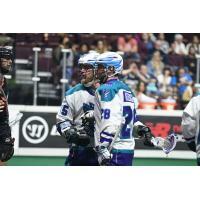 In two weeks, Rochester (2-6) will host its oldest rival, the Buffalo Bandits, on Friday, Feb. 22, as it throws it back to the first decade of Knighthawks lacrosse on Party Like it's 1995 Night. The fans can celebrate the freshest decade of all as they enjoy the musical hits from the '90s and other special themed promotions. The organization will also bring back the members of the 1995 team. Faceoff is set for 7:30 p.m.